Can Your Cute Little List App Do This? You are here: Home / Blog / Business / Can Your Cute Little List App Do This? Lists are easy. But managing a real life project using a list or notes app is like showing up to perform at a jazz festival with a rubber band. There are initial client meetings, planning, quotes, budget, and a statement of work. Major parts of the project are coordinated with other service providers: plumbers, electricians, flooring, drywall, and cabinet guys. Appliances are selected and purchased, with complex scheduling between cabinet, countertop, plumbing and appliance installers. Shopping lists are managed, tasks are performed in coordination with the service providers, expenses are tracked, and payments are made to sub-contractors. Cleanup, inspections, and touchups are scheduled and performed to the client’s satisfaction. 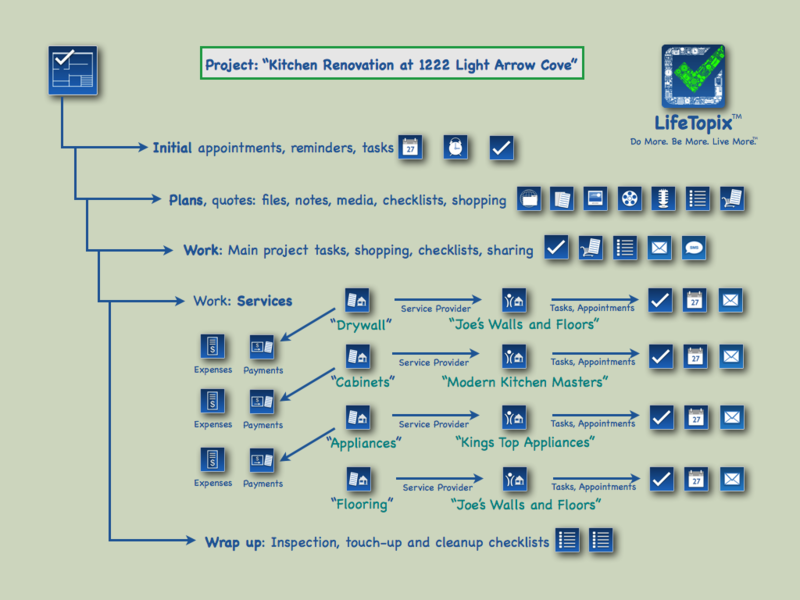 The sketch below describes what a real-life home improvement project looks like. Good luck doing this with a list or notes app! When your cool little list app is just not enough, you need a super app. This is where LifeTopix excels — a true organization, management and productivity app for professionals, small business, organized parents, and productivity heroes. http://lightarrow.com/wpcms/wp-content/uploads/2012/11/LifeTopixRealProject11.png 209 279 LightArrow http://lightarrow.com/mktgimages/lightArrowLogo.png LightArrow2012-11-06 06:28:152015-05-13 17:37:27Can Your Cute Little List App Do This? Thank you! We plan to develop an Android version in the future. You can follow our roadmap to see our future plans at http://lightarrow.com/lifetopix/roadmap.